February (Feb.) is the 2nd month of the year, coming between January and March, with 28 days in common years, and 29 days in leap years. In Sweden in 1732 the month had 30 days. This was to make the calendar match the rest of the world. In 1930 and 1931, February had 30 days in the Soviet Union because the government changed all the months to be 30 days long. This year February had 28 days in it. The name comes either from the Roman god Februus or else from "februa", the festivals of purification celebrated in Rome every fifteenth of this month. February begins on the same day of the week as March and November in common years, and August in leap years. February always ends on the same day of the week as October, and additionally, January in common years. Chocolates for Valentine's Day, February 14. February is one of the last two months to be added to the calendar at the beginning of the year (the other is January). This is because in the original Roman calendar, the two months of winter, when not much would happen in agriculture, did not have names. February is the second month of the year, coming between January and March, and is also the shortest month, with 28 days in a common year, and 29 days in a leap year. February begins on the same day of the week as March and November in common years and on the same day of the week as August in leap years. February ends on the same day of the week as January in common years and October every year. In a leap year, February is the only month to begin and end on the same day of the week. Every year, February starts on the same day of the week as June of the previous year. In common years, February finishes on the same day of the week as May of the previous year, and in leap years, August and November of the previous year. In common years immediately before other common years, February starts on the same day of the week as August of the following year, and in leap years and years immediately before that, May of the following year. In years immediately before common years, February finishes on the same day of the week as July of the following year, and in years immediately before leap years, April and December of the following year. February is also the only month of the calendar that, once every six years and twice every 11 years consecutively, either back into the past or forward into the future, will have four full 7-day weeks. In countries that start their week on a Monday, it occurs as part of a common year starting on Friday, in which February 1st is a Monday and the 28th is a Sunday, this was observed in 2010 and can be traced back 11 years to 1999, 6 years back to 1993, 11 years back to 1982, 11 years back to 1971 and 6 years back to 1965, and will be observed in 2021. In countries that start their week on a Sunday, it occurs in a common year starting on Thursday, with the next occurrence in 2026, and previous occurrences in 2015 (11 years earlier than 2026), 2009 (6 years earlier than 2015), 1998 (11 years earlier than 2009) and 1987 (11 years earlier than 1998). This works unless the pattern is broken by a skipped leap year, but no leap year has been skipped since 1900 and no others will be skipped until 2100. From circa 700 BC, when Numa Pompilius, the second king of Rome, added it to the calendar, February had 23 days and 24 days on some of every second year, until 46 BC when Julius Caesar assigned it 29 days on every fourth year and 28 days otherwise. Leap year Day, February 29, is added in every year that can be divided equally by four, such as 2012 and 2016, but this does not apply when the year ending in "00" at the turn of the century does not divide equally into 400. This means that 1600 and 2000 were leap years in the Gregorian calendar, but 1700, 1800, and 1900 were rather common years. This is where the Julian calendar calculated dates differently, as it always repeated February 29 every four years. February is a winter month in the Northern Hemisphere and a summer month in the Southern Hemisphere. In each hemisphere, it is the seasonal equivalent of August in the other. In weather lore, Groundhog Day, in the United States, is set to decide what the weather will be like for the rest of the winter. February's flower is the violet and its birthstone is the amethyst. The meaning of the amethyst is sincerity. The zodiac signs for February are Aquarius (January 21 to February 19), and Pisces (February 20 to March 20). Groundhog Day celebration on February 2. A Valentine's Day card for February 14 in the early 1900s. February 29 shown in a Swedish pocket calendar. Lanterns marking Chinese New Year. Chinese New Year, falls on a new moon between January 21 and February 21. Presidents' Day (United States) - Third Monday in February, celebrating the birthdays of Abraham Lincoln and George Washington. Six Nations (rugby union), tournament running from early February to mid-March between England, France, Ireland, Italy, Scotland and Wales. Winter Olympics are often held in February, last in 2010, and next in 2014. 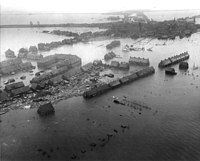 Flooding in the Netherlands on February 1, 1953. James Cook is killed in Hawaii on February 14, 1779. The trail left by the meteorite over Chelyabinsk on February 15, 2013. Damage in Chile after the 2010 Cauquenes earthquake on February 27, 2010. February 1, 1884 - The first edition of the Oxford English Dictionary is published. February 1, 1953 - In the night from January 31, parts of the Netherlands, Belgium and the United Kingdom are severely flooded. February 1, 2003 - Space Shuttle Columbia breaks up on re-entry into the Earth's atmosphere, killing all seven astronauts on board. February 2, 1913 - Grand Central Terminal in New York City is opened for the first time. February 3, 1931 - A magnitude 7.8 earthquake hits the cities of Napier and Hastings, New Zealand. February 3, 1959 - Buddy Holly, Ritchie Valens and The Big Bopper die in a plane crash in Iowa on the "Day The Music Died". February 4, 1948 - Ceylon, present-day Sri Lanka, becomes independent. February 4, 2004 - Facebook is founded. February 5, 1818 - Jean-Baptiste Bernadotte becomes King of Sweden. February 5, 1909 - Leo Baekeland announces the creation of Bakelite. February 6, 1788 - Massachusetts becomes a US State. February 6, 1840 - The Treaty of Waitangi is signed in New Zealand, officially making it a British colony. February 6, 1952 - Elizabeth II of the United Kingdom becomes Queen. February 7, 1979 - Grenada becomes independent. February 8, 1542 - Mary, Queen of Scots is executed. February 10, 1763 - In the Treaty of Paris, France has to give Quebec to Great Britain. February 10, 1863 - The fire extinguisher is patented. February 11, 1990 - In South Africa, Nelson Mandela is released from prison. February 11, 2011 - Hosni Mubarak resigns as President of Egypt, after widespread protests. February 11, 2013 - Pope Benedict XVI announces his resignation, effective at the end of the month. February 12, 1809 - Charles Darwin and Abraham Lincoln are born on the same day. February 12, 1818 - Bernardo O'Higgins signs the Independence of Chile near Concepcion. February 13, 1668 - Spain recognizes Portugal as an independent country. February 13, 1931 - New Delhi becomes the capital city of India. February 14, 1779 - James Cook is killed by local people in the Hawaiian Islands. February 15, 1965 - The Maple Leaf Flag becomes the Flag of Canada. February 15, 2013 - A meteorite explodes over Chelyabinsk, western Siberia, Russia, injuring over 1,000 people. February 16, 1918 - Lithuania declares independence. February 16, 1959 - Fidel Castro becomes leader of Cuba. February 17, 2008 - Kosovo declares independence from Serbia, which does not recognize it as an independent state. February 18, 1930 - Clyde Tombaugh discovers the dwarf planet Pluto. February 18, 1965 - The Gambia becomes independent. February 19, 1861 - Serfdom ends in Russia. February 20, 1472 - Orkney and Shetland become part of Scotland. February 20, 1929 - American Samoa becomes a US territory. February 21, 1613 - Mikhail I of Russia becomes Tasr, starting the Romanov Dynasty. February 21, 1848 - Karl Marx and Friedrich Engels publish the Communist Manifesto. February 21, 1958 - The peace symbol is designed. February 22, 1862 - Jefferson Davis officially becomes President of the Confederate States of America. February 22, 1979 - Saint Lucia becomes independent. February 22, 2011 - A strong earthquake strikes the city of Christchurch, New Zealand, killing 181 people, and destroying the city's cathedral. February 23, 1941 - Plutonium is first produced and isolated by Glenn T. Seaborg. February 23, 1970 - Guyana becomes a republic. February 24, 1918 - Estonia declares independence. February 25, 1921 - Soviet Russia occupies Tbilisi, Georgia. February 25, 1947 - Prussia no longer exists from this date. February 25, 1986 - Through the People Power Revolution, Corazon Aquino becomes President of the Philippines. February 26, 1815 - Napoleon Bonaparte escapes from exile on the island of Elba. February 26, 1993 - A terrorist bomb explodes in a car park under the World Trade Center, New York City. February 27, 1844 - The Dominican Republic becomes independent from Haiti. February 27, 2010 - The 2010 Cauquenes earthquake strikes Central Chile, causing major destruction and killing around 500 people. February 28, 1922 - Egypt declares independence. February 28, 1986 - Prime Minister of Sweden Olof Palme is murdered. February 29, 1960 - An earthquake strikes Agadir, Morocco, killing 3,000 people. February 29, 1984 - Pierre Trudeau announces his resignation as Prime Minister of Canada. February 29, 2004 - Jean-Bertrand Aristide resigns as President of Haiti following a popular rebel uprising. In February the Sun passes through zodiac constellations Capricornus and Aquarius. The signs of the zodiac within the month of February are Aquarius (January 21 to February 19) and Pisces (February 20 to March 20). February is the shortest month of the year. In a leap year, February 29 falls on the same day of the week as October 31. The birth flower of February is the violet. The Amethyst and the Pearl are considered birthstones of the month of February. Two of the most highly rated US Presidents were born in February - Abraham Lincoln and George Washington. Other US Presidents born in February are Ronald Reagan and William Henry Harrison, who was the shortest-serving President. Nicolaus Copernicus and Galileo Galilei, two famous astronomers, were both born in February.